Kia reveals four-seat coupe | What Car? 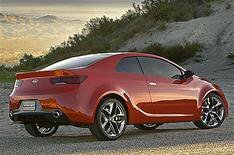 This Kia four-seat coupe concept car is expected to go into production by early 2010. Called the Koup, the car is based on the Cee'd hatch and its styling is derived from the Kee concept car that was unveiled at last year's Frankfurt motor show. The concept car is powered by a version of Kia and Hyundai's 2.0-litre petrol engine, but this one has a direct-injection system and a turbocharger to produce 286bhp. The car's cabin is closely based on the Cee'd's, although the steering wheel features gearshift paddles to control the six-speed gearbox. If the car goes on sale in the UK, it is expected to do so early in 2010.